Lately I started hating my mascara. I’d been using it for at least 15 years, but I’d noticed that whenever I bought tubes now, it seemed near empty right from the start. Consequently I wasn’t getting much on the brush or my lashes, and it was also flaking a bit. Time for a new mascara. Coincidentally, I had recently started feeling pangs of guilt about my lack of vegan in my lifestyle. So when Jenna got some vegan mascara from Urban Decay, and loved it, I got inspired. Turns out that although UD isn’t an entirely vegan line, they do have a whole vegan section of makeup that includes a pretty vast array of products. Lush Lash Mascara, $20 – Their lush lash mascara is billed as growth serum-infused conditioning mascara. I’m not sure how or if that part works, but I am really impressed with this product. I was curious about the hour glass shaped brush, but found that application was easy enough with it. They say it’s not technically waterproof, but that you may need a product to remove it. To both of these points I can say that yes, even after several crying jags and a couple of naps, this stayed on perfectly. I had no trouble washing it off with regular soap and water either. There was no flaking or smudging at all. It also makes my lashes super long! Very exciting after not getting too much out of my old brand for so long. I was a little concerned when I ordered it that I didn’t have to specify a color, but it is indeed a lovely jet black. As an added bonus it comes in pretty purple packaging and is comfortable to hold. It’s got 5 stars on the reviews on their website for good reason! Lip Junkie Lipgloss, $19 – Another 5 star reviewed product, the lip junkie lip gloss does not disappoint. It has a slight minty tingle as it goes on and a very mild, pleasant minty scent. The applicator tube makes it easy to apply without having to fuss with a brush, and it has a really nice texture too. It’s thick enough to stay put for hours, but not sticky. SO important in lip gloss. It also moisturizes, which is key. My last purchase of my fave lip gloss until now was ironically, chapping my lips so bad! I tend to wear lip gloss to work and in the day time, (and the lipsticks that don’t come off if I’m going out, so I’ll be trying their lipstains next), so I picked what looked like a fairly understated shade, Wallflower. Understated it certainly is! It’s about the shade of my unglossed lips, but it does even out the color so it still looks nice. I’ll be going for something a little deeper on my next purchase, but I’m very happy with its performance, none the less. Discontinued Purple Liner – I managed to grab a bottle of awesome purple liquid liner for $6 that was being discontinued. They have a new set of 24/7 Waterproof Liquid Eyeliners available in a huge array of colors that replaced the bottle version, $18. This may be a technical issue they were trying to correct, as the new ones are in mascara looking vessels and there were some negative reviews about the bottle shape of the one I bought being hard to get at when it gets low. I will probably give this a go when my current standard black one runs out. As far as the color of this one is concerned though, it’s a gorgeous vibrant purple, just how it should be. I hate buying color makeup only to find the color to be dull out of the package. I put it on as soon as I unpacked it over my black eyeliner and it stayed on very well for the rest of the day. I look forward to using this more in the future. Heavy Metal Glitter Eyeliner, $18 – This was just a fun extra purchase. It’s glitter in a clear base, as I learned from the reviews, which was a point of contention for some people trying to get a pure line of glittery color. I guess it’s possible with a lot of coats. However, I thought it was a pretty good thing because I can put it over my black eyeliner or purple or wherever I like. I put it over my black eyeliner first just to see how it looked, and it looked great. Some of my black eyeliner did come off on the brush though, so it may work better over their waterproof liners. Then I put on the above purple liner and added some more. (See pic below.) It looked pretty and stayed on all day, but I found the glinting in the periphery of my eyes a little disorienting in sunlight. But that tends to be the case with glitter (and fake eyelashes) in general, and you get used to it after a little while. So not an everyday use item for me, but still fun for every once in a while. Additionally, they included a free sample of two Stardust Eyeshadows, also vegan, in Space Cowboy (beige) and Retrograde (frosty purple). I thought the beigey one was almost identical to the one I use all over my lids every day to keep them matte, but it was a little darker on than it looked, like a light tan. I wouldn’t use it as an everyday shadow though, due to the glitter in it. Not only did it do that distracting sparkly periphery thing, but it ended up all over my face in just a few hours. I really prefer my shadows to be matte. The sparkle was a little nicer in the soft lavender Retrograde color, but the color wasn’t anything special on my pale complexion. So no, I don’t think the stardust shadows are for me, but it’s always fun to try something different for free! Overall a very positive experience with them so far, and it doesn’t hurt that their packaging is all purple. 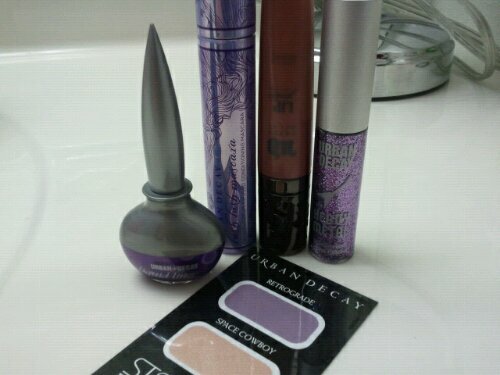 ; ) I’m already building a new shopping cart of vegan makeup on the UD website, and can’t wait to try more. Thanks Urban Decay! I know, I LOVE the mascara so much! haha that was my first thought too Jenna!